The New Testament gives some guidance for our understanding of our duties and responsibilities as citizens. It does not give specifics, but it does set parameters. Government is to be respected, obeyed, and appreciated; but it is not to be followed blindly, nor should it be obeyed when obeying means disobeying God. But working out the details of this has always been a problem. Always. We should not be surprised at our frustrations today, nor should we be surprised at how vehemently Christians can disagree, even though they might all be trying to obey God. Even the most brilliant and most godly people have struggled and failed in this area. The person in church history I have found most helpful in understanding the role of the Christian in government is Martin Luther. And, the writings and political work of Martin Luther has had a huge influence on the government and politics of the modern world. He is considered by many to be among the three most influential people of the last one thousand years. Luther’s work challenged and changed not only the church, but many aspects of society, including government. But even though he opened the doors to much needed reform, and taught so clearly on so many of these issues, he made some of the biggest mistakes of his life when he got embroiled in politics of his own day. Luther did not choose to become tangled up in politics, but his involvement could not be avoided. The church and state were so interconnected in those days that one could not make a move in one without causing waves in the other. Luther was the first to work to pry these two apart. The separation of church and state we hear so much about now (and still have a hard time defining) goes back not to Thomas Jefferson, but to Martin Luther. 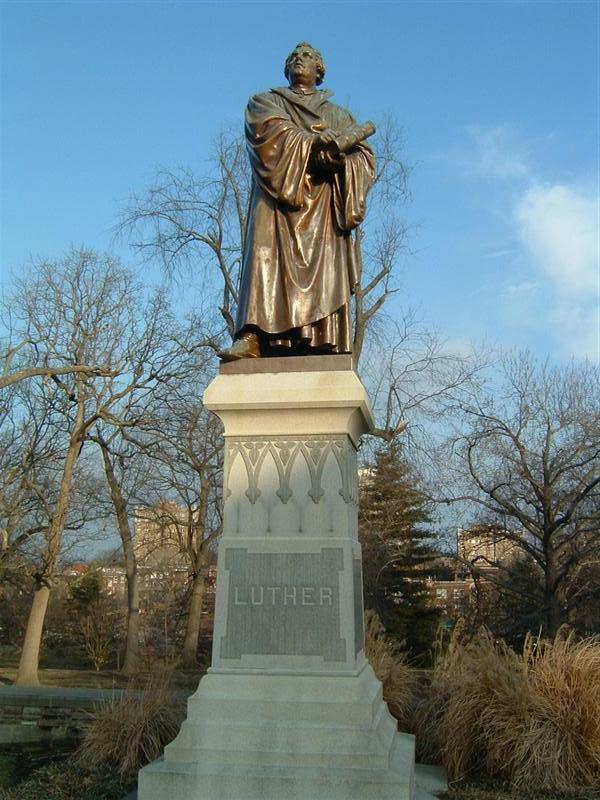 Luther’s involvement brought him endless turmoil, great danger, many failures, and much regret– even though he was not acting selfishly and had no interest in gaining political office or power. He just wanted to serve his neighbor in Christian love and help make things better– but he could not. For example, at first Luther supported and encouraged the common people in their struggle to become free of the tyranny of and oppression by both church and state. But he then regretted what he unleashed when the people’s struggle for freedom led to violent rebellion and lawlessness. Then Luther supported the government in the use of its legitimate God-given authority to restore order. But the king sent an overwhelming force, killing men women and children by the tens of thousands. Then Luther regretted having anything to do with the authorities. But by then the damage was done, and Luther never regained the near universal support of the people that he had once enjoyed. Throughout Luther’s life his work in the church brought him into conflict with the government. Though he was one of the most brilliant human beings who ever lived, he awkwardly muddled his way through the politics of the day, oftentimes doing more harm than good. Even the best and brightest get muddied and bloodied in this arena. Sin clings to each of us and to everything we do. This does not mean that everyone is equal in the political realm. There are foolish, greedy, and wicked people in politics, and there are people who act with great wisdom and nobility; but it is a messy process and it stains all involved. And it doesn’t help that the citizens they serve, we who vote for or against them, are also selfish, foolish, fickle, and wicked. We are endlessly irritated at government incompetence and corruption, but if we took seriously the presence of sin, we would be surprised that anything gets done at all. And some things do get done. For example, most of us leave our homes each day and drive on roads that our government somehow manages to build and maintain. Our government provides this, and much more to be thankful for. Paul was right when he said it is a gift of God provided for our well being. G. K. Chesterton was an English journalist of a century ago who had much to say about religion and politics. He had a sharp wit and could be very critical of everything, but his main overall approach to life was one of gratitude to God. There are two memorable quotes by him on government, coming at it from those two different angles, criticism and gratitude. His critical side came through when he said, “As long as we go on cursing the system, the system is quite safe.” His gratitude came through when he said, “The way to love anything is to realize that it may be lost.” We have seen on the news what happens to nations when the government loses control. All his life he cursed the sin in the system of government; but then with gratitude to God, Chesterton could still love its many blessings, knowing how much worse off we would be without it. I Timothy 2:1-4 — I urge, then, first of all, that petitions, prayers,intercession and thanksgiving be made for all people— for kings and all those in authority, that we may live peaceful and quiet lives in all godliness and holiness. This is good, and pleases God our Savior, who wants all people to be saved and to come to a knowledge of the truth. Almighty God, supreme Governor of all, incline your ear, we beg you, to the prayer of nations, and so overrule the imperfect counsel of human beings, and set straight the things they cannot govern, that we may walk in paths of obedience to places of vision, and to thoughts that purge and make us wise; through Jesus Christ our Lord. Amen.